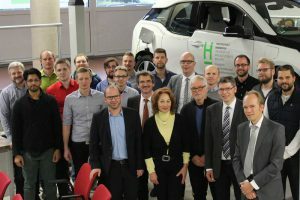 The Institute of Engineering Design, Mechatronics and Electromobility was founded in October 2016 at the Hanover University of Applied Science and Arts. At the moment eight professors from faculty I – Electronic Engineering and Information Technology and faculty II - Mechanical Engineering and Bioengineering Technology along with 22 employees do research on subjects in the field of construction, machine elements, mechatronics, control engineering as well as electrical machines and drive technology. At the institute, personnel and material resources to research are bundled in one place. Big advantages of this merger are the professional exchange, the shared use of existing infrastructure and the resulting synergy effects.